I have been working on this updated Home Tour on and off for a few months. Long periods of time would pass between work sessions where I would completely forget about it. I gave myself until the end of the summer to wrap it up. True to form I waited until the very last minute…but it’s finished. Click on the little bird to see my Home Tour 2011. 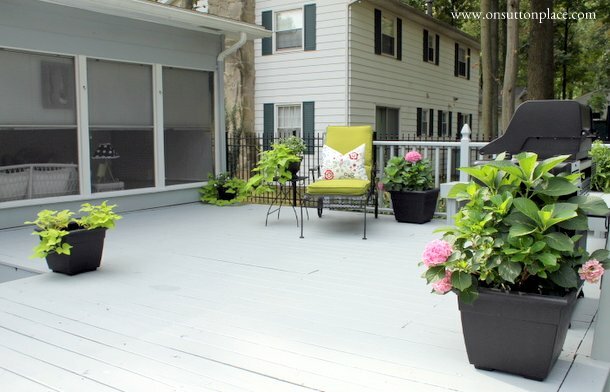 You have so many fabulous porch spaces. I love them all. Props on a very beautiful home! What a lovely home you have! I hope you don’t mind but I pinned some of it! Ann, you have the most beautiful home! Everything is just gorgeous! 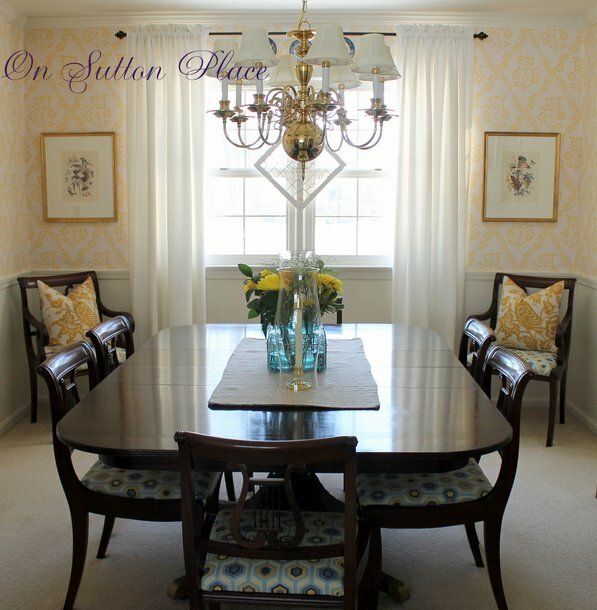 Your taste in furnishings and fabrics is stunning! Very well done! My daughter’s name is Sutton, so naturally I love the name of your blog!! 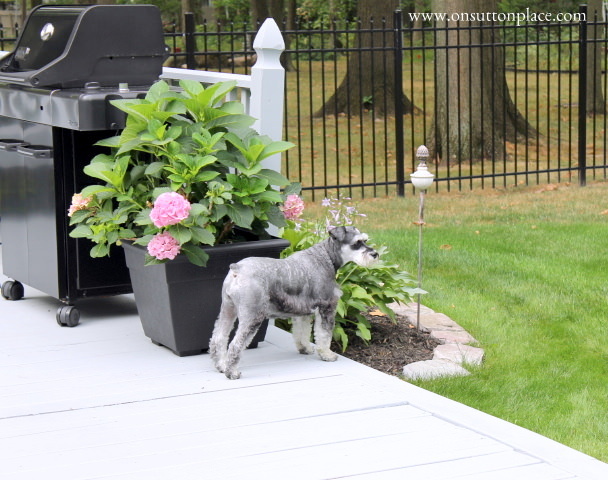 (She just turned one – see her on my blog at A Penny For A Thought.) I also enjoyed your home tour. I liked that you incorporated a lamp on your front porch. 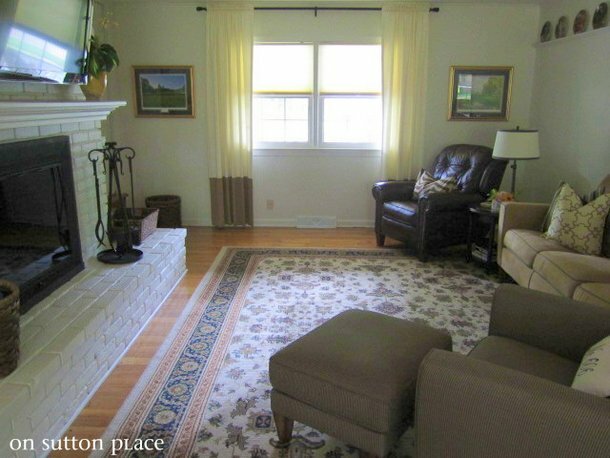 It really makes it another living area. Thanks for sharing! Beautiful home Ann. 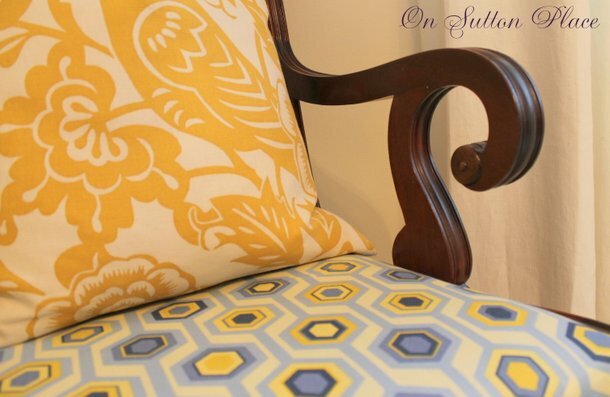 Love the yellow and all of your choice of fabrics! I would love that porch…. Ann, thanks for the delightful tour! I loved seeing the seasons on your front door. I’ve always loved your kitchen and that gorgeous lantern over the island. 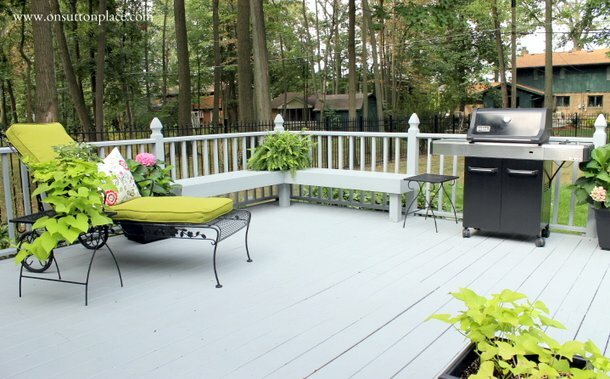 Your back porch is sooooo inviting and that deck and outdoor living space….oh my!!!! Wow! 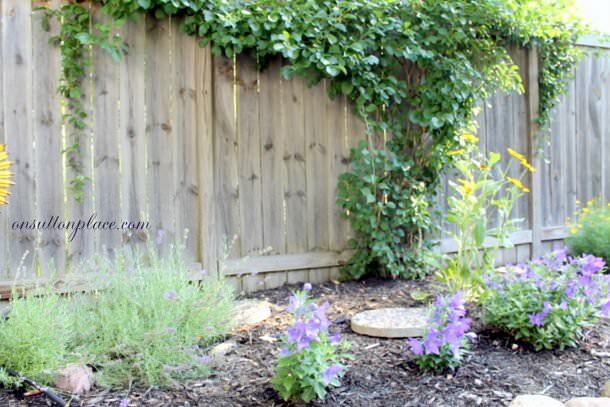 I adore you back porch…it has been one of my favourites since the first time I saw it!!! Lovely pictures. Oh, Ann, your home is just beautiful. Every room has so many pretty details and I love all of the beautiful fabrics. I can tell you put your heart into it. Thanks so much for the tour ~ I really enjoyed it! Well good morning! 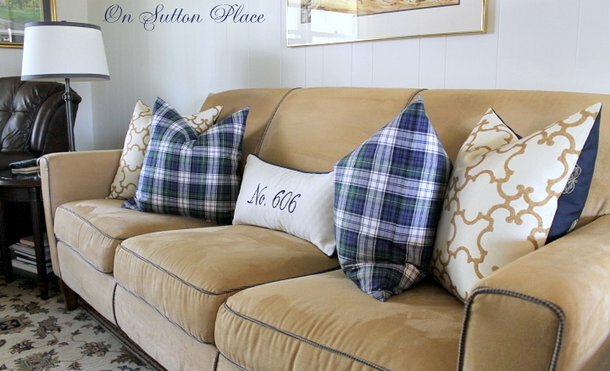 I just clicked over here from Savvy Southern Style and I just love your blog, your home and your Etsy shop! You have a new fan :) I must say I am always glad to see another mom of older kids (mine are 26 and 27) with a blog–I enjoy reading so many beautiful blogs but we have a different focus now, don’t we?! I am going to contact you about a red tickiing table runner but today is the first day of school and I am a teacher so I guess I’d better get moving! WOW! 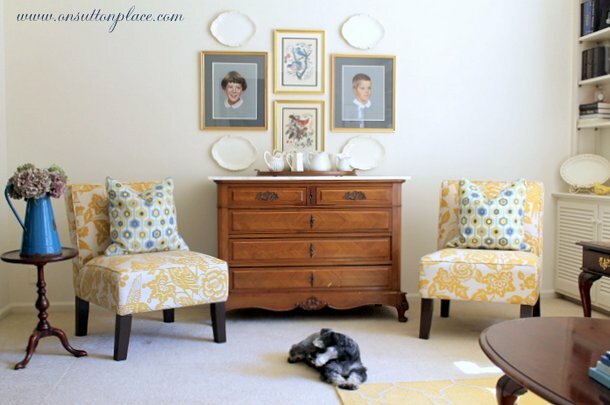 How fun to get to see your personality in your home tour…..I LOVE that yellow and white floral fabric and chairs….. your home has such a sweet and homey feel. 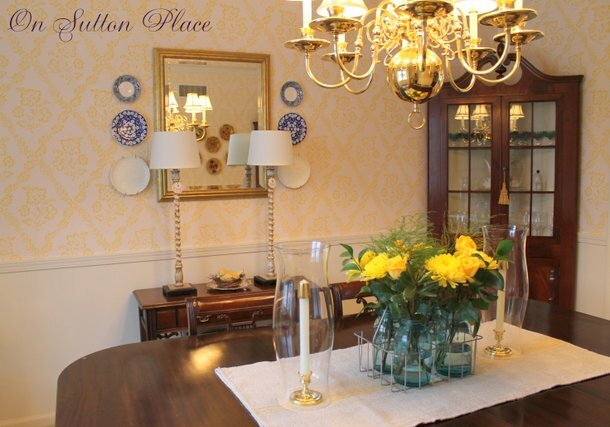 Ann, I am loving your home tour! I like how you have the yellow accents follow through all the rooms. And I love your dining room furniture and corner cabinets. Very pretty all around! What a great tour you have given us!! You have a beautiful home. 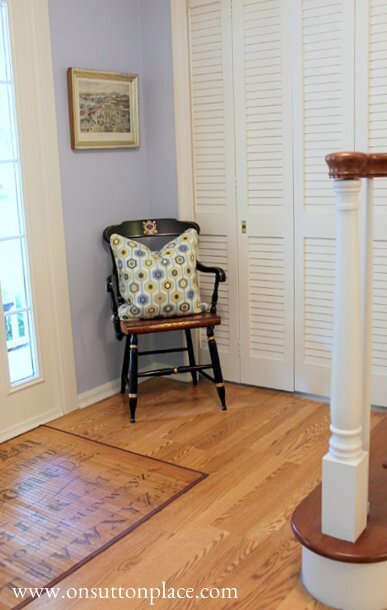 I love the colors throughout your house and your style! 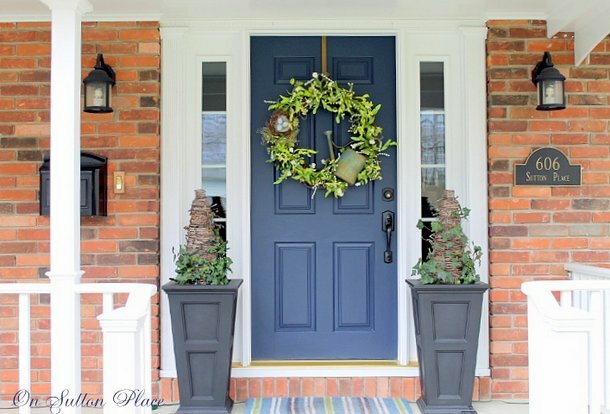 Those planters on your front porch are just what I’m looking for! 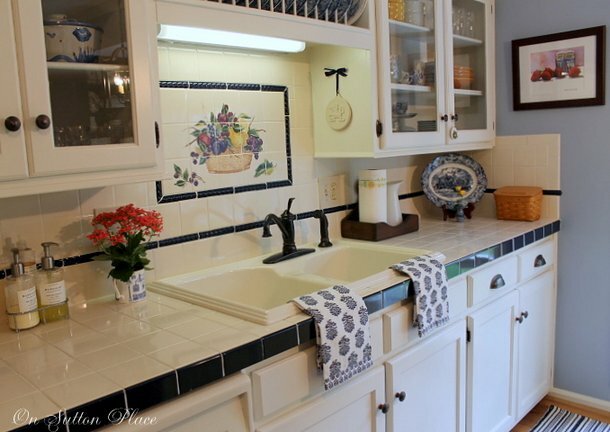 Beautiful home tour Ann. I just love how fresh and lovely everything in your home is. Ann, your home is just beautiful and fresh and welcoming. I see your talent all over it! What a lovely style you have!!! And I just love that you took pictures of the front porch all year ’round! You are something special, Ann! 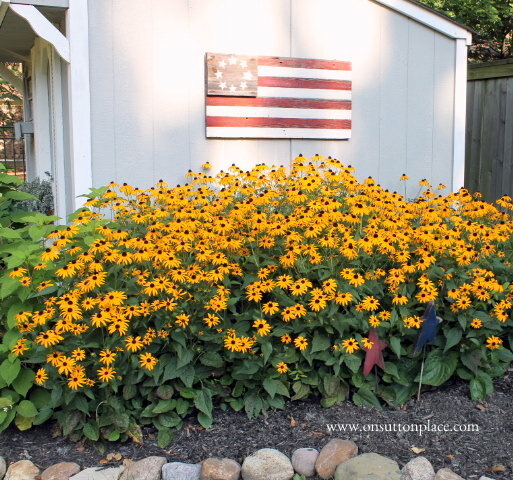 Such a beautiful home Ann, thanks for sharing it. Your porch is always so fun to look at, wish I could stop by and sit a while. 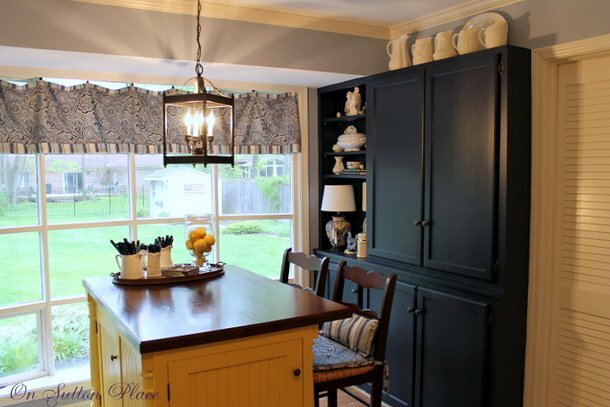 Love the blues and yellows you have used in the house, so relaxing and fun. Thanks Ann, you have a beautiful home. I like how you left your tables in their original state. Thank you for taking us on this tour of your home, Ann. It is all just gorgeous. I enjoy your style and decorative sense, and your home looks so gracious and inviting. Oh, Ann! What a gorgeous home! I could just move in there with you! 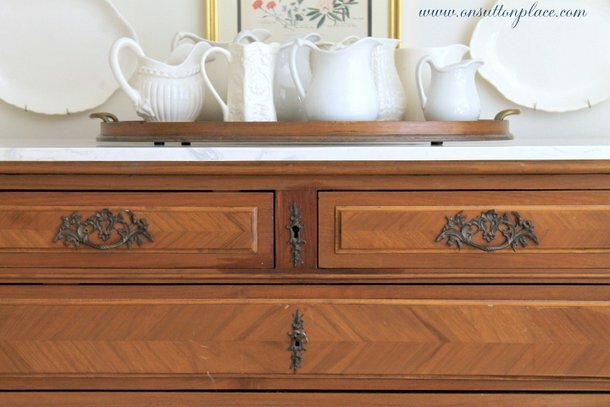 I had those same Queen Ann style tables you have in your living room! Love all of your pretty pillow and the fabrics you’ve used. 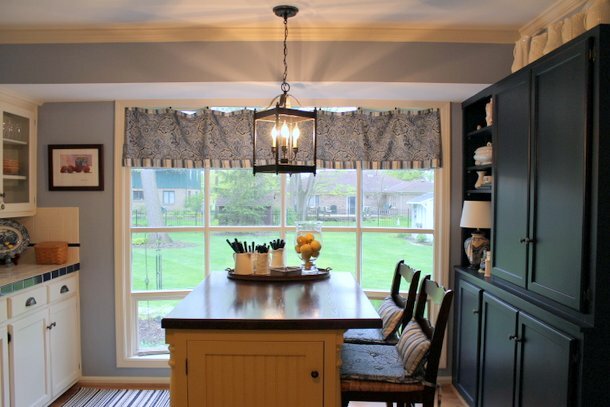 Your kitchen, your sun porch! :) And you know I have a soft spot in my heart for little Schnauzers! I must say you are one talented lady! Your home is beautiful. 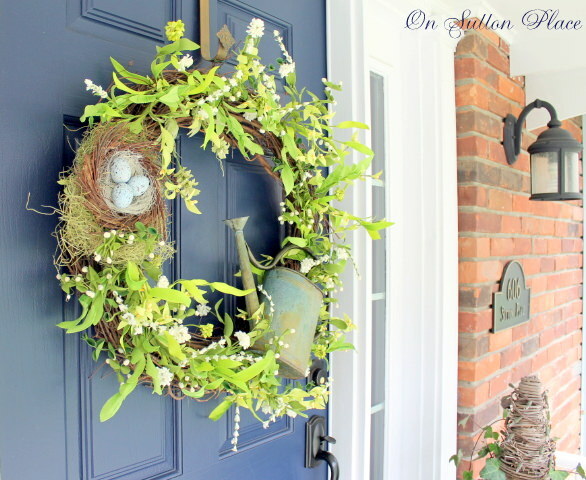 I especially enjoyed seeing how you decorated your front porch for the different seasons. 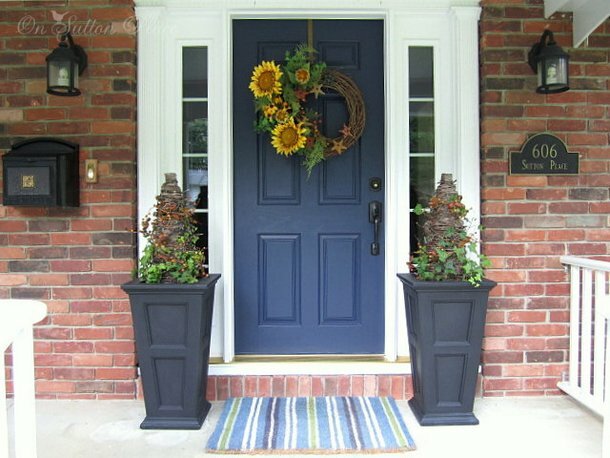 I love the tall black planters in front of the door. I would like to copycat them for my door. where did you buy the planters? Thank you. Your home is so welcoming…so beautiful! 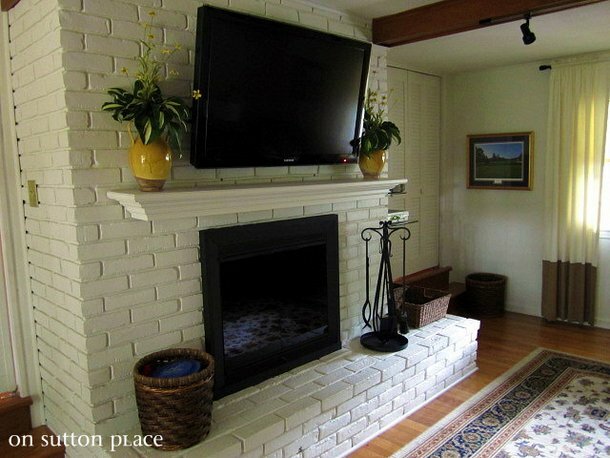 You have thoughtfully decorated each room with soft harmonious colors. I love the soft blue throughout and all the warm touches to go with it. 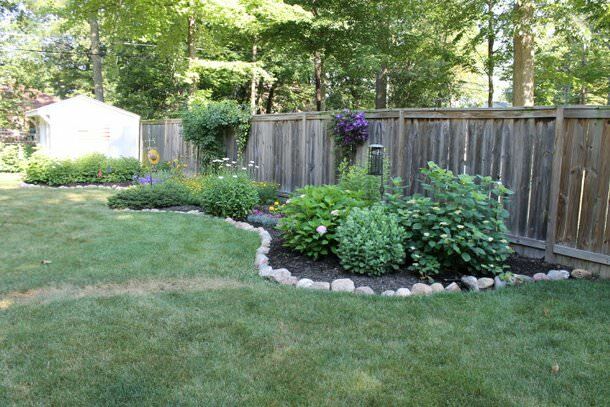 Your home’s exteriour is as lovely as the interior. You have left nothing undone. How I love your kitchen. It beckons to come and dine. Thank you for sharing your home tour, my friend! Wow! I love your style! Thanks for sharing on Cowgirl Up- I shared your post on my fb page tonight. Feel free to grab a “I Was Featured” button from my sidebar. Your house is just beautiful, everything is so lovely! I love the entry and stairs and your porches best. Everything is so perfectly coordinated. It has a welcoming look about it, too though, and that’s very important. It is absolutely beautiful inside and out! Thank you for the tour! So many things to love. 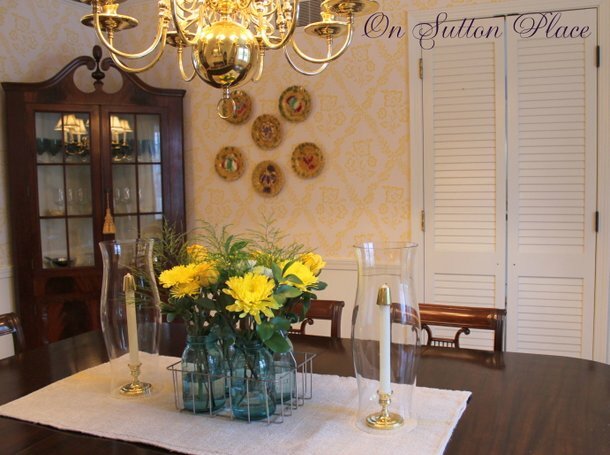 I love your spring wreath, the yellow chairs and the antique chest in the living. 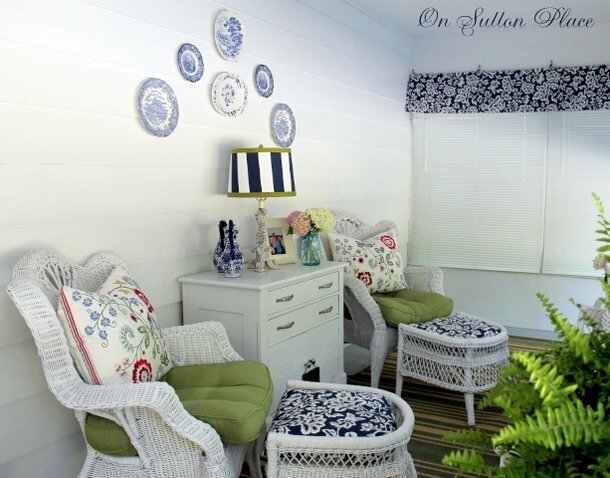 Your back porch is too cute!! Love it and thanks for sharing. 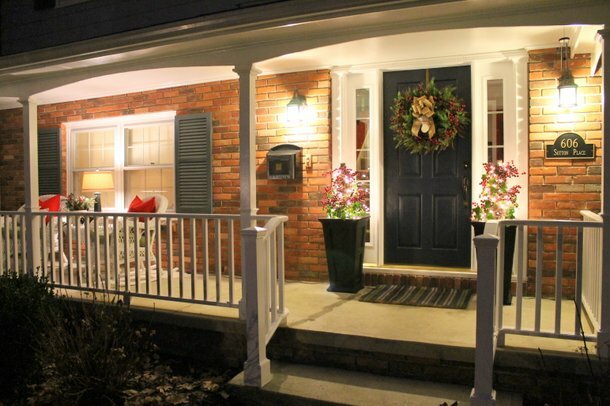 Ann, your home is absolutely beautiful, with your front porch being one of my favorites (LOVE the color)! 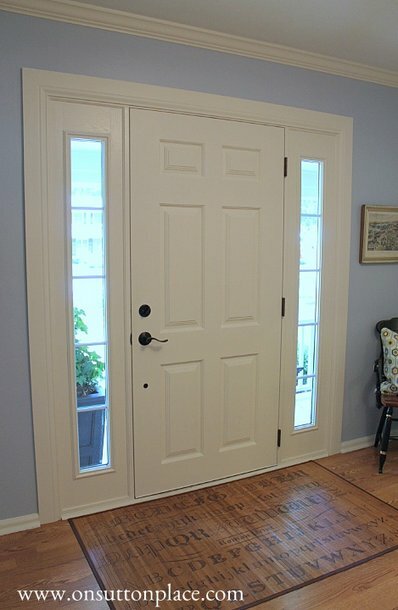 The transformation of your entry is stunning, and your kitchen is fabulous … so much character. 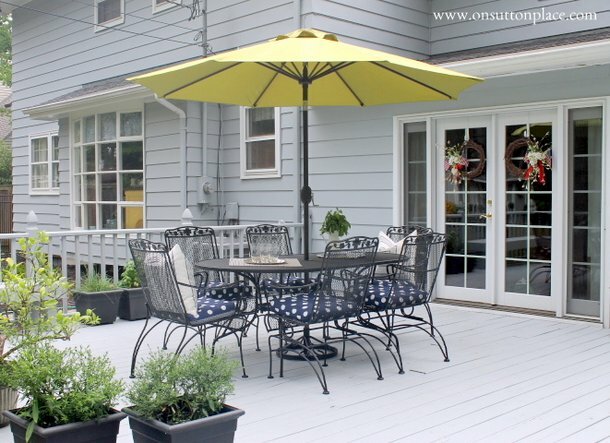 I’d love to enjoy an evening on your inviting back deck, too! Thanks so much for sharing … I’m off to take the tour again! I thank you for this tour! Every section of your house is so lovely. I just sat and looked at each room in awe, you are one talented decorator. Your home is just beautiful – I love everything about it ! You have done an amazing job, and have wonderful taste. I really love how you have ‘lightened’ up the colors – that is what I want to do in my house…Do you mind me asking what is the color in your living room – on the walls ? There are so many whites to choose from, and I think your color is perfect – thanks so much !! You have such a beautiful home Ann. 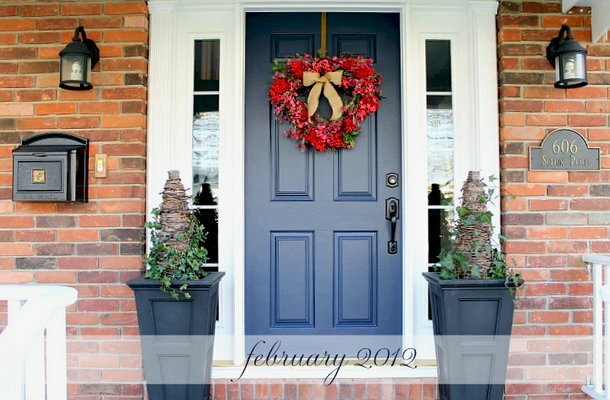 I loved seeing all of the different seasons on your front porch. You have a lovely, lovely home Ann! Thank you for the tour! 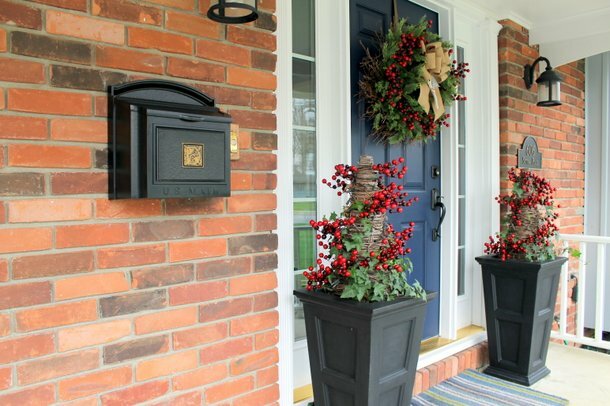 I really enjoyed seeing the seasonal changes on your front porch. Ann, what a wonderful home tour. Even though I had seen everything before, I liked how I could see the seasonal changes of your wreaths and your front porch. I could really get comfy on your back porch. 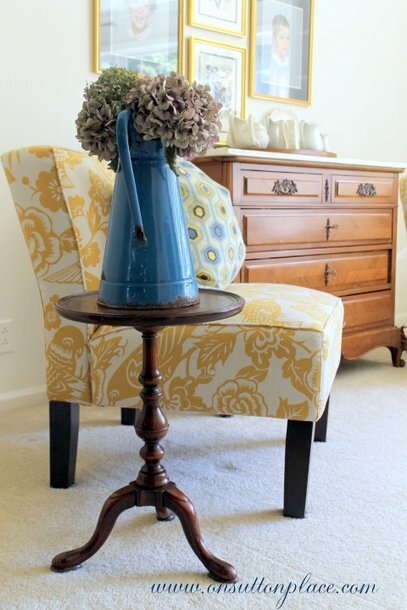 I just love all the fabrics you used there as well as that cute polka dot lamp shade! You really have a flair for decorating. Gorgeous Ann, you have such a lovely home. Ann, your home is so beautiful!! 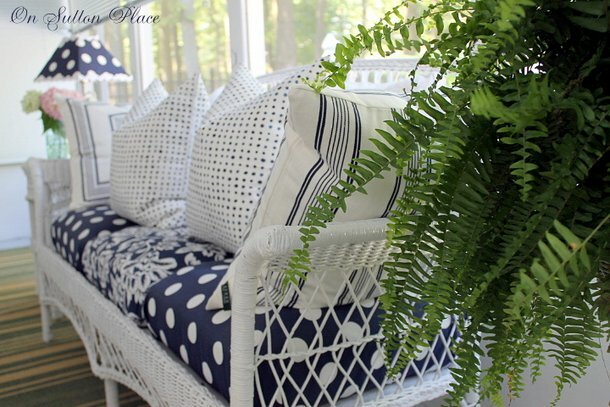 Love, love, love your front porch and back porch…so comfy and cozy!! You have such a beautiful home…if I HAD to choose a fav. room it would be the back porch. Love that! You have a lovely home. 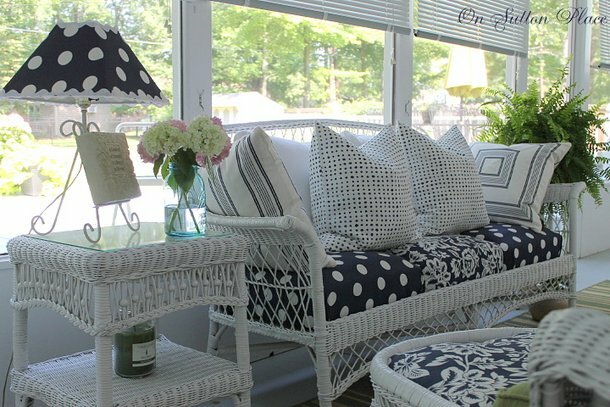 I simply adore white wicker! 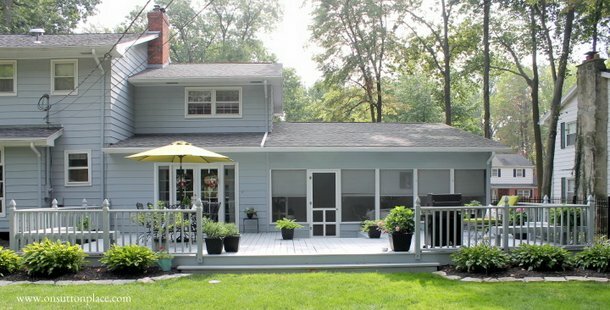 Lovely home, back porch ….my favorite !!! 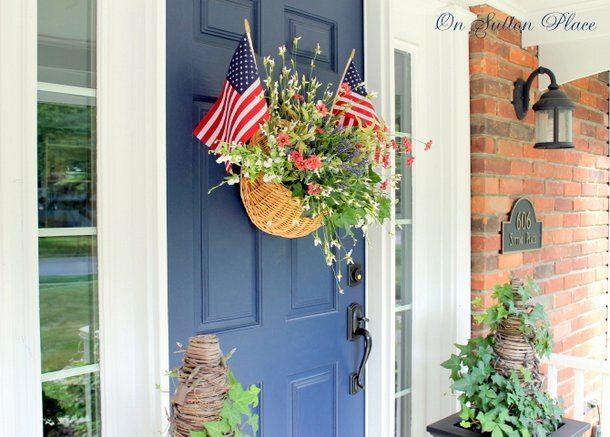 beautiful home…I love how you decorate your porch-makes me wish I had one! Fabulous tour! Your kitchen is my favorite but.all rooms were well done. 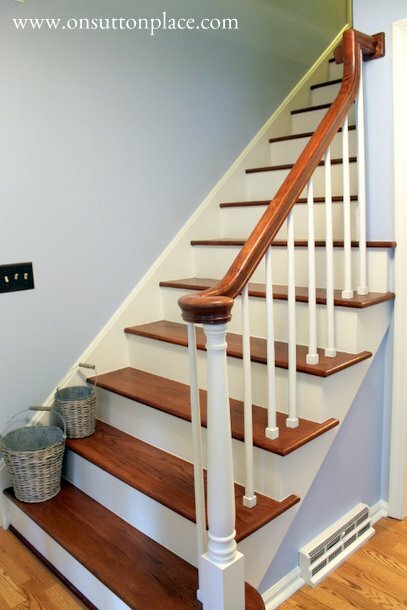 I see you have kept the stairway wall uncluttered since it was painted! What a beautiful home Ann! 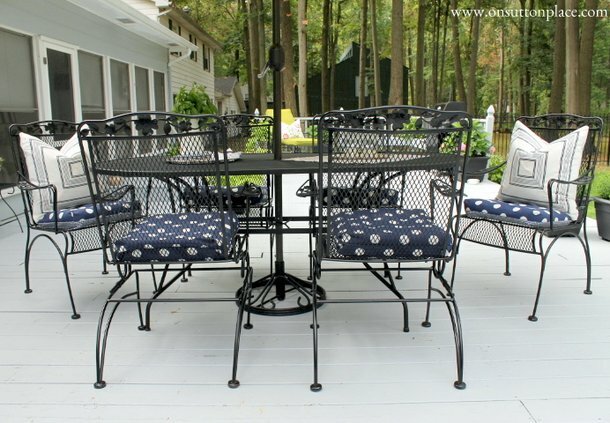 My fav is your back porch, I just love the black and white and green, you have done such a great job on your home! What a gorgeous tour Ann. I need to update my tour too sometime!~ Funny you should do this tour today, because I was going to ask you if you wanted to do a tour over at my place sometime in the future. I adore your home! Thanks as always for joining me. Everything is quite lovely ..I am in love with the kitchen! 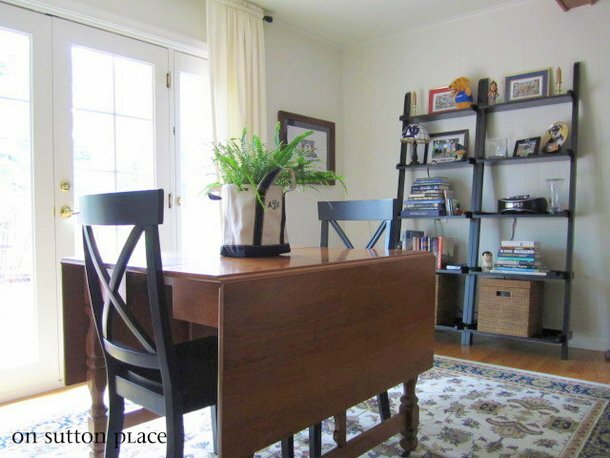 I love white kitchens but the kicker with yours ( in my book ) is that cubboard / cabinet on the other side in a different color. The whole house is lovely and the gardens as well. 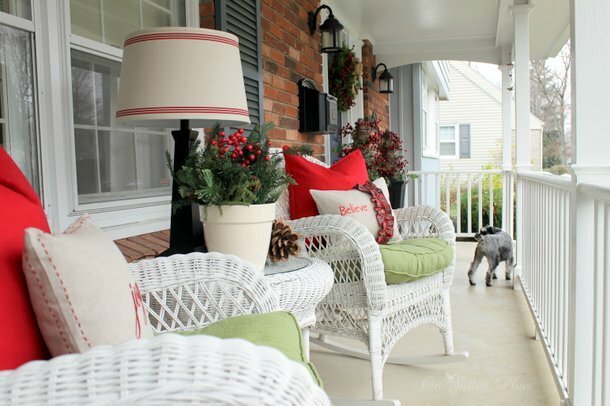 It was alot of fun to view your porch seasonally! Thanks for inviting us into your beautiful home! I love the porch! It’s all lovely and shows your loving touch. Your home is lovely, Ann! I really like the color combinations you used. Love seeing your whole tour at once! You’ve got style – love your use of bright color and patterns. 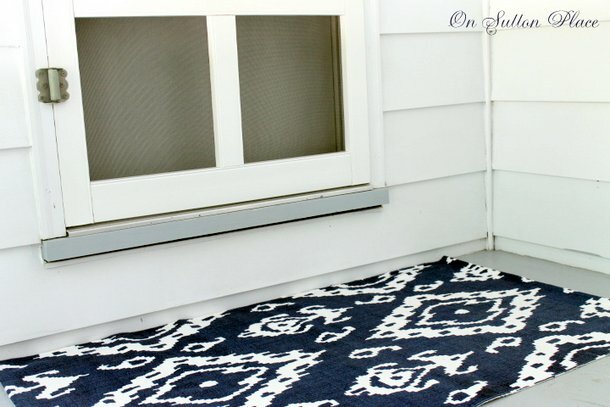 Even your porch and patio rocks and your dog is the cutest! This is a beautiful collection, Ann! I especially love your back porch. 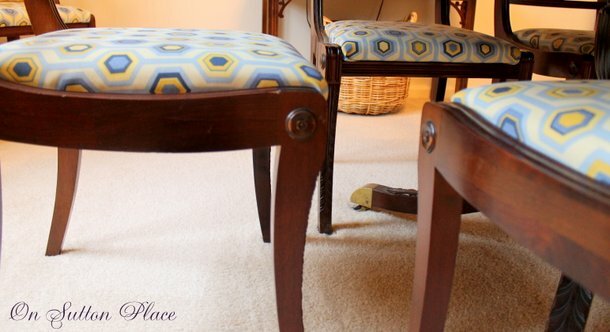 The cheerful yellows and blues throughout your home really add a vintage – modern touch. 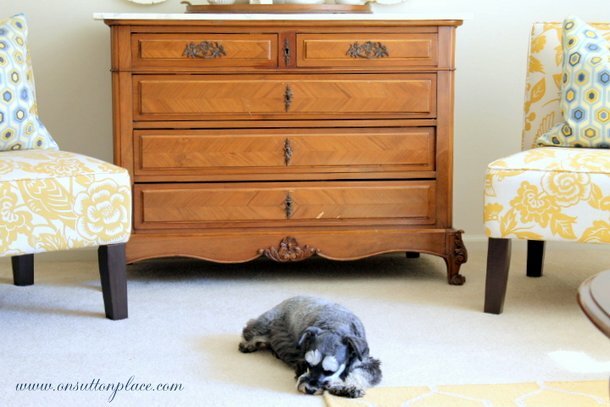 Your little pooch looks like she’s in charge! What a gorgeous home and such gorgeous photography! Love it all! I love your home. The colors are so calming and the house so welcoming. 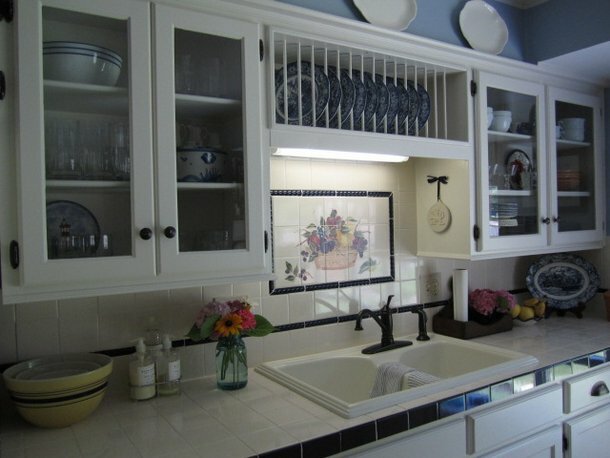 The corner china cabinet is beautiful and the back porch and deck are lovely as well as your beautiful yard. Thank you for the tour. 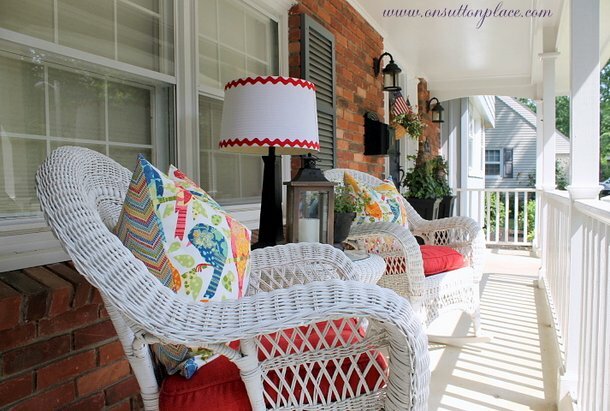 Your home is stunning….I just love the colors you have chosen in each room…so very light and cheerful…and I also loved seeing the beautiful seasonal changes of your front porch…Your home and gardens are as gorgeous as your items in your shop….thanks for the wonderful tour! You have made so many lovely changes to your home. Thanks for sharing. 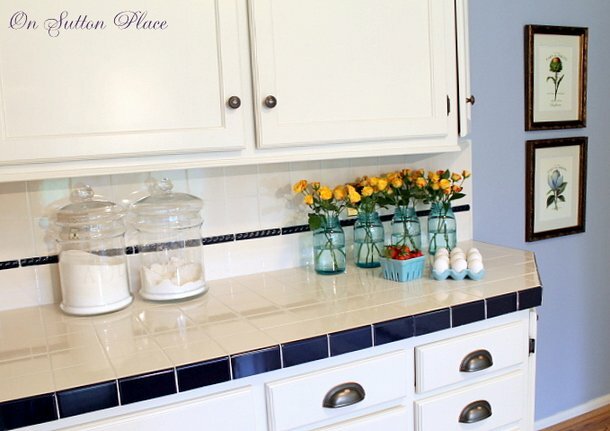 BTW – Do the glass canisters on your kitchen counter seal tight? 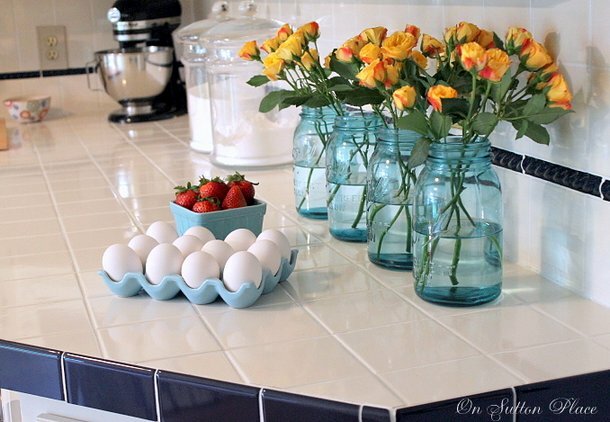 I love the look of glass canisters, but I really want to keep things fresh and bug-free. Stunning! I love the colors and the feeling in your home. Everything is so neat and pretty. I would be very comfortable there. 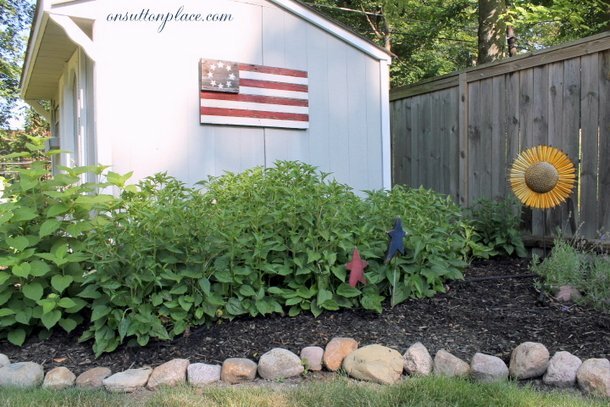 I have a question about the planters on your porch….did you order those from that website that pops up on all the blogs? I noticed that you don’t have any real plants in them, is there room to plant something large? So beautiful…..when can I move in? Ann, you have a beautiful and LARGE home! I love your color combos. 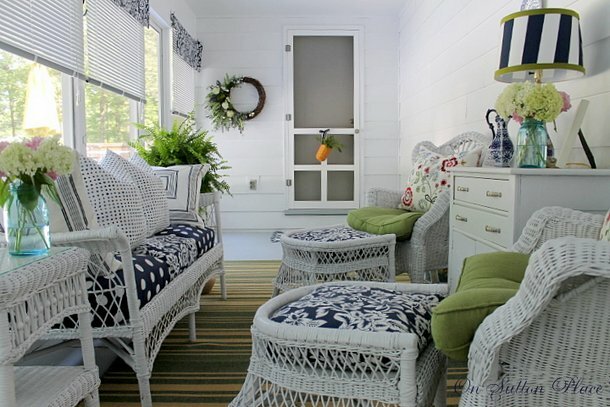 and white wicker, well, I can’t get enough of white wicker. I love, love, love it! 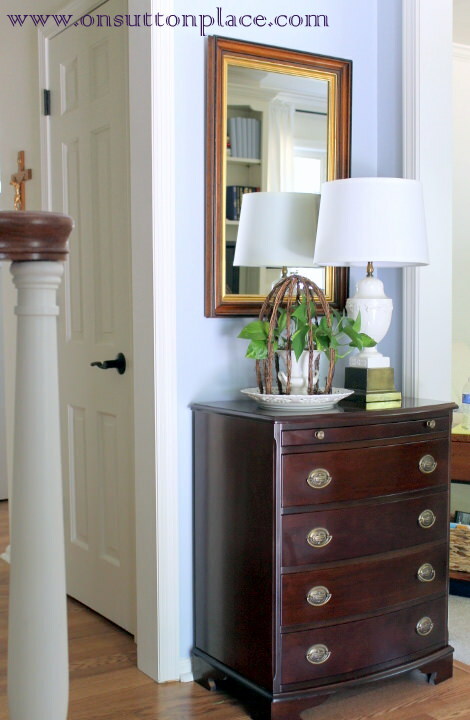 There are so many lovely, personal touches in your home. It looks so inviting! Thanks so much for sharing!!! What a beautiful home. So peaceful and inviting. Thanks for taking the time to show us around. You have such a lovely cheerful home. I love the happy colors you chose. 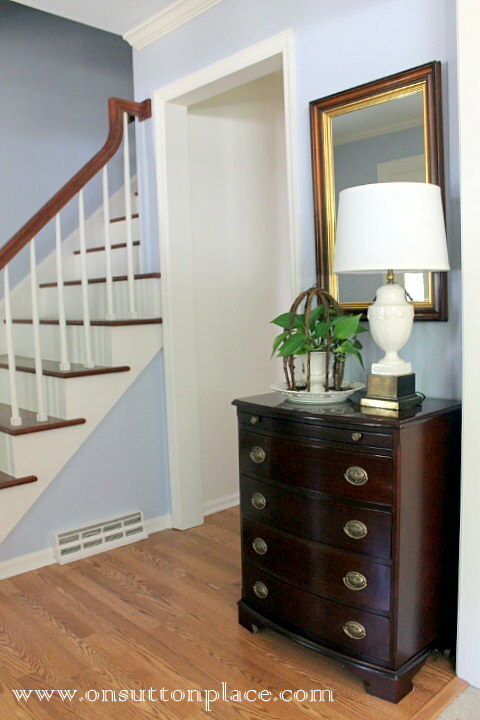 Since you lightened your foyer, it flows much better with the rest of your home now. 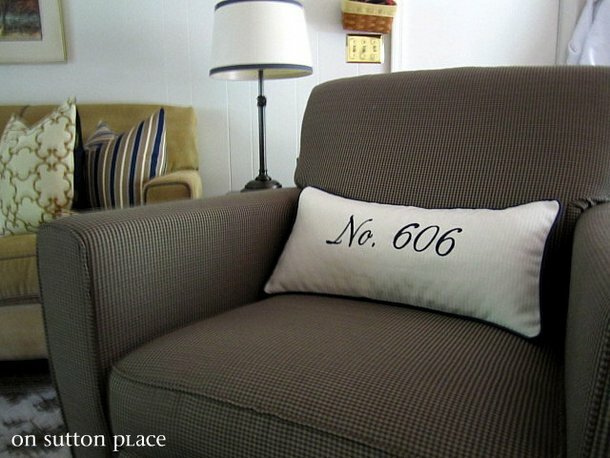 All of your handmade pillows add just the right touch too. Love everything about your place. I really liked seeing all the pic in one place, this is the first time I realized there was a front and back porch area. I understood the deck portion, but now it all comes together for me. Great photos I love the shot of the eggs and strawberries in the kitchen and this Summers front porch. You have surely figured your new camera out. You have such a pretty and cheerful home. It must make you happy each time you come home! :D I love the yellow. How can you not be happy in a living room like yours! Your home is simply lovely, Ann! The color palette of blues and yellows is casual and elegant at the same time. 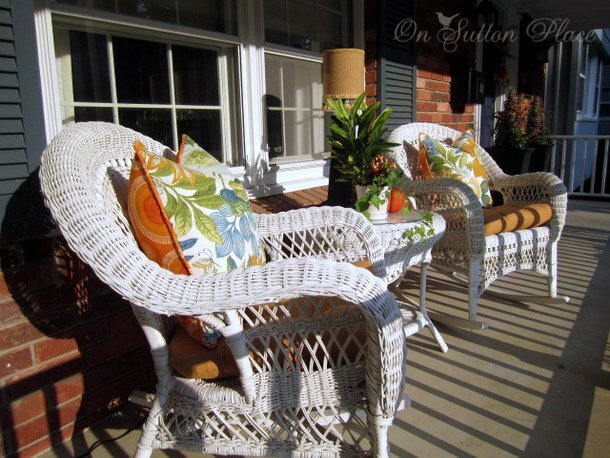 I love how cheerful your front porch and sun porch are! You really have created a wonderful and relaxing home! Hi Ann-Love the accessories. Noticed the flowers on the dining room table and then I saw the ceramic egg carton. Do you like that? I really want one .. just curious if you use it or is it a pain to switch out the eggs? Love your home. You make everything look so welcoming and beautiful. You know I had to smile every time I saw your dog in a photo. 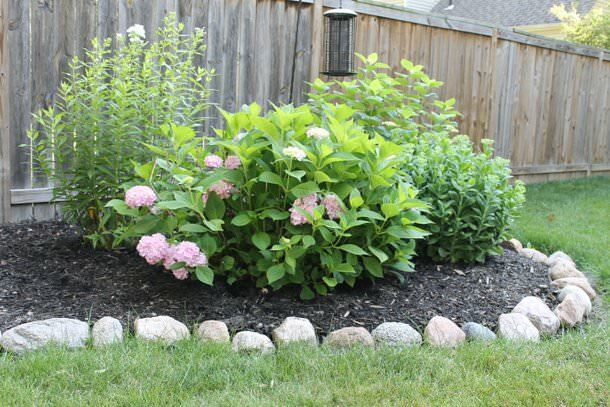 Your home is just beautiful Ann! love how it all flows with your common color palette. 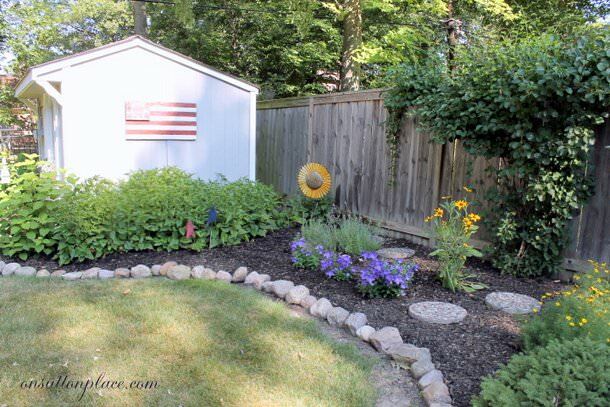 Good morning Ann, Your home, porch, deck and garden is absolutely lovely. I do miss your red wallpaper though. ;o) I just have a “thing” about red. The wreaths that you’ve designed are beautiful and very festive.. Your fur baby is very photogenic and has a fantastic yard to roam and play in.